The American Civil Liberties Union of Iowa is filing a lawsuit that seeks to establish a precedent in state courts for the release of police body camera footage. A federal judge’s action has released the video recorded when a Burlington police officer shot at a dog, but wound up shooting a 34-year-old woman to death in 2015. 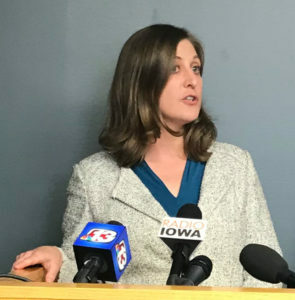 Rita Bettis Austen, legal director for the ACLU of Iowa, said the lawsuit seeks to overturn the Iowa Public Information Board’s recent decision that keeping the footage secret did not violate the state’s open records law. Bettis Austen describes body cameras as expensive equipment that’s been “sold to the public” as a way to hold police accountable. “And yet, despite that promise, the decision that the Public Information Board that we’re appealing essentially says body camera footage can remain entirely secret unless the police want to disclose it,” Bettis Austen said. Autumn Steele died in January of 2015. The Des Moines County Attorney reviewed witness statements and body camera footage and determined the officer who shot Steele would not face charges. Just 12 seconds of video from the incident was released to the public. Last fall, after the family’s wrongful death lawsuit was settled, all of the body camera footage was released when a federal judge unsealed evidence in the case.